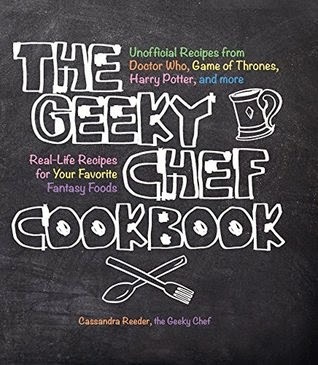 George R. R. Martin's epic fantasy series A Song of Ice and Fire is notorious not only for its graphic violence and political intrigue but also for its loving and lengthy descriptions of food, with passages spanning several pages to describe one meal... They're really my kind of books. It's almost impossible to choose just one dish or treat, so I made a poll for you all to help me decide. 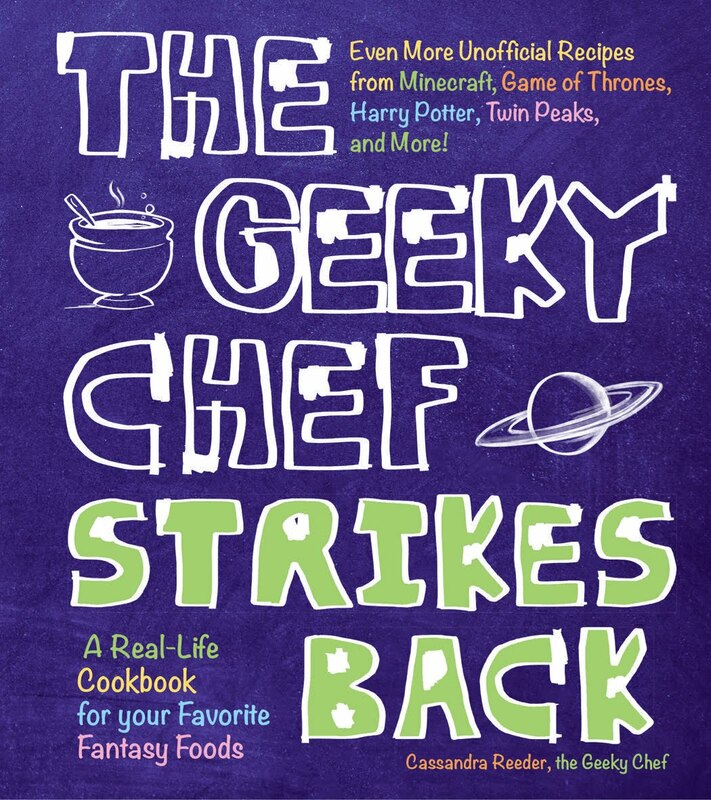 It ended up being the closest poll in Geeky Chef history, Lemon Cakes beat out the Garlic and Herb Crusted Rack of Lamb and the Honey Cakes by just a few votes. Those of you who voted for other things, don't fret! You can still try out all the tasty options. There's an amazing site called The Inn at the Crossroads dedicated solely to the food of ASoIaF and historical cuisine, you should really give it a visit. As many of you probably know, Game of Thrones (the HBO television adaption of A Song of Ice and Fire) is about to begin its third season, and most of us have eagerly anticipated seeing our favorite characters again. 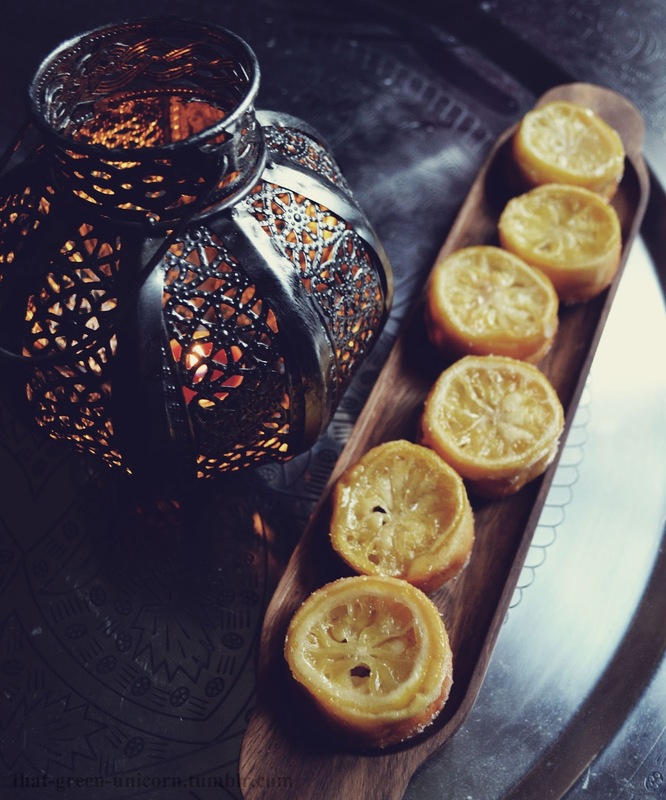 I personally plan to make a feast to celebrate and my version of Sansa Stark's favorite dessert, Lemon Cakes, is on the menu. 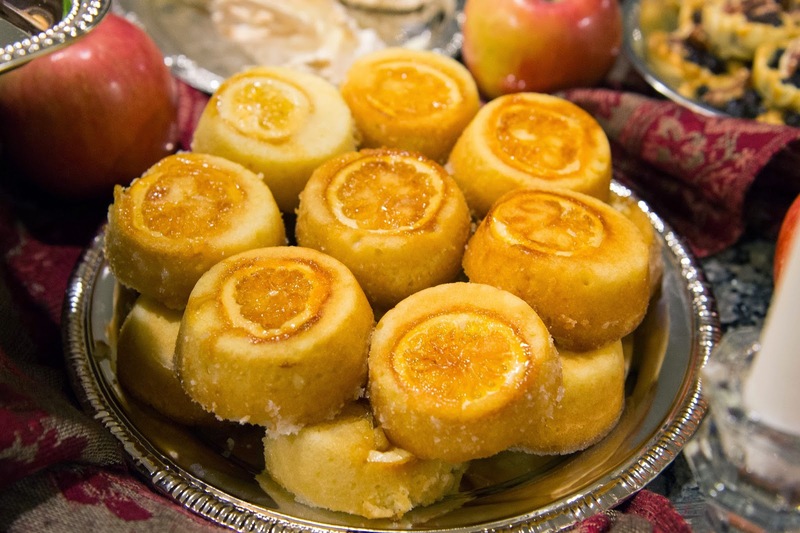 The Lemon Cakes are mentioned pretty often in the books, but not described in detail. My impression of them was that they were a sort of tea-time treat for young lords and ladies to enjoy. I pictured them being very rustic in appearance and having a dense, moist texture with intense lemon flavor. My cakes are just that, and baked with a sweetened lemon slice for garnish. I hope you like them as much as Sansa Stark does! 2) Boil lemon slices for about 15 minutes in 1 cup of water and 1 cup of sugar. 3) Grease a muffin tin with butter, vegetable oil or non-stick spray. 4) In a mixing bowl, combine flour, baking powder, baking soda, and salt. 5) In another bowl, beat butter and 1 cup of sugar until light and fluffy. 6) Beat in eggs, then beat in 2 tablespoons of the lemon juice and lemon zest. 7) Beat in flour mixture and then buttermilk. 8) Place 1 lemon slice in the bottom of each muffin cup. 9) Divide batter between cups, pouring over the lemon slices. 10) Bake until cakes are firm and golden, about 15 to 20 minutes. Remove from oven and let cool. 11) Mix together remaining lemon juice and sugar. Poke holes into the cakes, then slowly pour lemon and sugar mixture over the cakes so the juice gets absorbed into the cakes, let set for about 5-10 minutes. 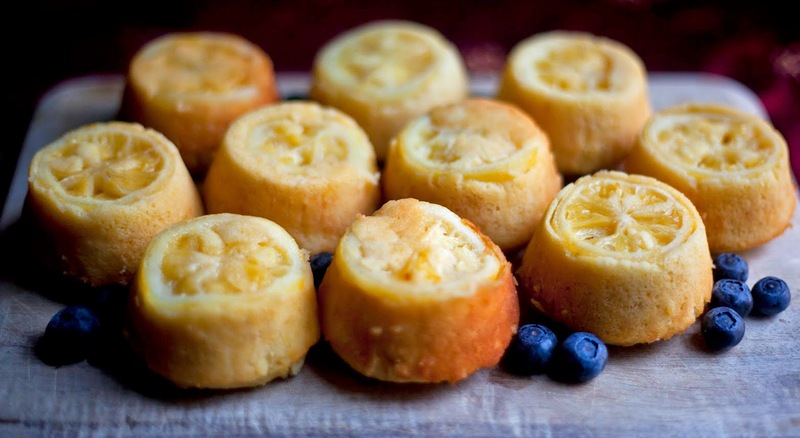 12) Remove cakes from muffin cups and serve lemon slice side up! You're welcome! Hope you like them! These look great! I have just one question (and I should preface this by saying I have no idea about food history, and I don't know much about the historical accuracy of Martin's world, the so I'm not trying to challenge you, I'm just curious): You imagine them as a sort of tea-time treat for young lords and ladies to enjoy, but you also picture them as very rustic. It's been my impression that rustic-looking food has only recently been elevated to a higher popular status, and that historically lords and ladies at tea would favor things that were well above the rustic food of the masses. Hey Z! Good points! You are completely right about highborn people enjoying more decadence and flair in their food than the peasants. Game of Thrones is fantasy (so none of the historical food rules may apply, as you pointed out) but it is highly influenced by the War of Roses period in English history, which would be the 1400s. So we're talking medieval. I'm definitely no expert and I may be totally wrong, but I was fairly certain that these would be pretty fancy for that period. At that time, peasants didn't each much more than stews and hard bread. Even in Cercei's epic feasts, the focus definitely seems to be more on the taste and the overall quality/variety of ingredients than the appearance of the food, with all the roasted meats, pies and soups. When I said "rustic, " I meant rustic by today's standards. I might actually research this now, just to make sure, haha! I really appreciate your comment, and I totally welcome any criticism, thoughts or corrections. I enjoy just discussing this stuff, anyway. Occasionally I'll even alter recipes if someone points out an inaccuracy. Thank you for posting! I've seen LOTS of Game of Thrones inspired lemon cakes, but these beat them all! Great job and thank you! When does the lemon zest go in? I made these yesterday in the UK, and ended up making about 22/23 cakes with the batter. 2 1/2 cups = 420g fyi. I didn't use the zest because it's not mentioned further in the recipe, and also because four tablespoons? Are you sure you don't mean teaspoons? That is a lot of lemons you have to zest if it is tablespoons (I'm speaking as a Brit whose tablespoons measure 15ml). I added more lemon juice to the cake mix to give it a more lemony kick and it was fine. The recipe also mentions that butter be melted but then says to mix with the sugar until it's light and fluffy - perhaps it should have said softened? I decided to make these for a GoT rewatch party after looking at various lemon cake recipes and, boy howdy, am I glad I chose this recipe. I was a little nervous about how they would turn out because I thought that the lemon syrup might make them too sweet, but they were perfect. I didn't add any lemon zest, and I used three lemons for the lemon slices rather than two. I still had a little more batter than lemon slices, so when I make this recipe again I'll use four lemons. These were such a hit at the party that I intend to make them anytime I want to convince people that I'm a wizard in the kitchen. Thank you for this recipe! Just wanted to say that I made these for a fellow GoT fan, and they turned out great. Properly tart and not super-sweet. Skipped the syrup and instead made a glaze of powdered sugar, lemon juice and zest, for a more visible/decorative touch. I think it was a good idea, but will make the glaze thinner next time so the lemon slices show through better! Also, I either sliced the lemons too thin or boiled them too long. Made a second batch and only boiled about five minutes and that was plenty I think. If you want to make sure the lemon slices hold up (and they look amazing in the finished product!) you'll definitely want at least 3 lemons. Thanks for the recipe! About to bring them to a party and sure they'll be a hit. These were absolutely delicious!!!! My whole family loved them and called them "heavenly." I am so excited to make these for a Game of Thrones party and with the Sansa cosplay that I'm putting together. Thank you so much for this awesome, easy recipe!!!! Hello! I want to make these dinner party, but I'm wondering: Can they be made ahead and frozen if necessary? Great recipe! The liquid left over after boiling the lemon slices makes great lemonade if you dilute it with ice and water! I just made these in honor of the S4 finale and they are so delicious! I added about a tbsp of vanilla extract to the lemon sugar mixture that you pour over them at the end. Also I was too lazy to add lemon zest, but it's lemony enough. Thanks for the recipe! How do you recommend storing these bad boys? I plan on making them ahead of time for something. 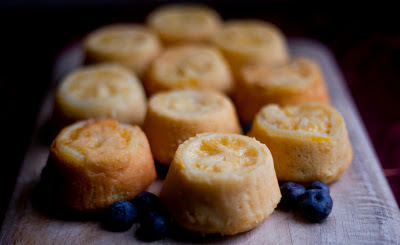 These are the best lemon cakes, exactly what I had in mind and they taste fantastic! One small suggestion: why not use the syrup left over from the candied lemon slices as the syrup for the cake? It already has a lovely lemon flavor plus no waste! These were delicious! Made them for a season 6 finale viewing party a while back- I should've made a double batch.